Sam Allardyce has told Mike Ashley and Rafa Benitez to patch up their relationship – and "get on with it" at Newcastle United. Allardyce was Ashley's first sacking at St James's Park, with the club's owner having inherited thim when he took over at St James's Park 11 years ago. The 63-year-old went on to manage Blackburn Rovers, West Ham United, Sunderland, Crystal Palace and Everton. He also had a short spell as England manager in 2016. And Allardyce – who has clashed with Benitez in the past – has had his say on what needs to happen at his old club. "If you're going to be successful, harmony at the top's very important – communication and pulling in the right direction," said Allardyce. "Whether that's happening with Rafa and Mike, I'm not privy to that information, but, certainly, from my point of view as a manager, the relationship between the owners and you as a manager is critical. "(A club) can succeed, but you have to put your differences to one side, both the owner and you, as the manager, and work together to get on with the job. "Whether you like each other or not doesn't particularly matter, as long as you do the business and the best for the football club. "I was there for seven months, and never really had a relationship with Mike – he wasn't the type. He wanted other people to run the club and he wanted to come along and enjoy the ride. I don't know whether that's changed or not." 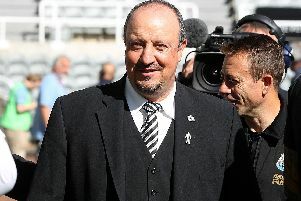 Benitez expressed his disappointment at the lack of funds provided to him in the summer, when the club made a profit of more than £20million on player trading. "Because (in the transfer market Benitez is) limited, as we all find ourselves with whatever club we're at, we try and use our tactics and the players we've got to the best of our ability," said Allardyce. "The Newcastle fans give (Ashley) a lot of stick, but he is the owner of the football club and he has put his money in. Whether that's enough or not, he decides how much money he wants to give the club, and it's up to you as the manager to try and spend that as wisely as you can. "Only time will tell if Rafa has. He certainly did last year. He finished very, very strongly. This year's a difficult start but maybe again they'll come through. New players again – we all have to settle players in very quickly, and that's very demanding as a manager." Meanwhile, Allardyce believes it is too early to predict whether Newcastle, beaten 3-2 by Manchester United at Old Trafford on Saturday, will suffer a third relegation in 10 years under Ashley.
" (It is) early days yet," said Allardyce. "We saw West Ham go four defeats on the trot, and then they came around against Everton and Manchester United. "There has to be a bit of light at the end of the tunnel when you score two very good goals in the space of 10 minutes, as we saw at Old Trafford."